Touchstone Books. Paperback. GOOD. Spine creases, wear to binding and pages from reading. May contain limited notes, underlining or highlighting that does affect the text. Possible ex library copy, thatâll have the markings and stickers associated from the library. Accessories such as CD, codes, toys, may not be included. Touchstone, 1968. Paperback. Very Good. Disclaimer:A copy that has been read, but remains in excellent condition. Pages are intact and are not marred by notes or highlighting, but may contain a neat previous owner name. The spine remains undamaged. At ThriftBooks, our motto is: Read More, Spend Less.Dust jacket quality is not guaranteed. Touchstone, 1968. Paperback. Good. Disclaimer:A copy that has been read, but remains in clean condition. All pages are intact, and the cover is intact. The spine may show signs of wear. Pages can include limited notes and highlighting, and the copy can include previous owner inscriptions. At ThriftBooks, our motto is: Read More, Spend Less.Dust jacket quality is not guaranteed. Touchstone / Simon & Schuster, 1962. Trade Paperback. Good. Spine creased, surface tear to spine base. 1962 Trade Paperback. 295 pp. Includes photographs. CONTENTS: World of the Forest; Good Death of Balekimito; Making of Camp Lelo; Song of the Forest; Crime of Cephu, the Bad Hunter; Giver of the Law; Play World of the BaMbuti; Molimo: The Dance of Death; World of the Village; Elima: The Dance of Life; Marriage of Kenge; Village Initiation and Magic; Forest Horizons; World Beyond; Dream World; A Note on Pronunciation; Glossary; Index; Maps; llustrations. Touchstone Books, 1983-09-01. Paperback. Very Good. Touchstone Books. Used - Good. Shows some signs of wear, and may have some markings on the inside. Touchstone Books. Used - Good. Ships from Reno, NV. Shows some signs of wear, and may have some markings on the inside. 100% Money Back Guarantee. Shipped to over one million happy customers. Your purchase benefits world literacy! The Forest People, a Study of the Pygmies of the Congo. NY: Touchstone Books. Good; Staining on pages and page edges. Previous owners info on front end . page, some of which has been blackened out. Reading creases on spine.. 1983. Paperback. 0671201530 . 8.20 X 5.30 X 0.90 inches . Simon and Schuster. 1962. Paperback. UsedGood. Softcover; fading and shelf wear to exterior; otherwise in good condition w ith clean text, firm binding. .
NY USA: Clarion, 1961. Paperback. VG, Owner's Name End Page. Illus. by Photos. 8vo - over 7¾" - 9¾" St.. Touchstone, 1962. pp.295 with index b/w photos. clean tight copy slight creases to corners and rubbing to edges and spine hinges. Fourteenth Printing. Soft Cover. Very Good ++. 8vo - over 7¾" - 9¾" tall. New York, NY, U.S.A.: Touchstone Books, 1962. Seventeenth Printing. Trade Paperback. Good. Brief summary of condition and content available on request by e-mail. Simon & Schuster, New York: 1961. Softcover. reading copy. Pages are discolored. A study of the Bambuti Pygmies of the Congo by a young anthropologist who lived among the Bambuti for three years, not as a clinical observer from the outside world, but as a friend, learning their customs and sharing their daily life. 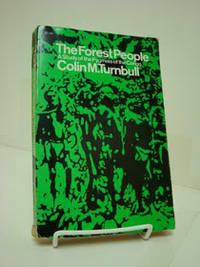 In this celebrated account, he describes their hunting parties and nomadic camps, their love affairs and ancient ceremonies - the molimo, in which the Pygmies praise the forest as provider, protector, and deity; the elima, in which the young girls come of age; and the nkumbi circumcision rites, in which the villagers of the surrounding non-Pygmy tribes attempt to assert their authority over the Pygmies, whose forest home they dare not enter. Includes an Index. ISBN: 0671201530. New York: Simon and Schuster, 1968. Green & black soft cover. Edges rubbed. Pages clean with no markings in text. . Soft Cover. Good. 8vo - over 7¾" - 9¾" tall. Touchstone Books. Used - Acceptable. Acceptable condition. Writing inside. Bookplate inside. Slightly dampstained. Touchstone Books. Used - Good. Good condition. Stamped on page edges. Foxing on page edges.